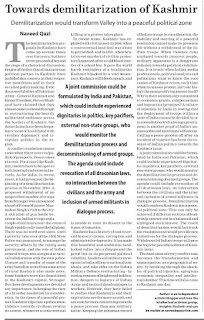 The demilitarization proposals for Kashmir have come up several times over the years, but have never proceeded much beyond the stage of a rhetorical discussion, despite of the fact that all mainstream Indian political parties have included this concern in their respective manifestos and in their so called policy making. Even the powerful elites of Pakistani Army - General Karamat and former President, Pervez Musharaf have claimed that they almost came to a breakthrough in restructuring the heavily militarized ambiance across the borders of Kashmir, but these claims have been forgotten or more or less diluted with cavalier diplomacy and irregular politics in the region. A conflict resolution cannot come when there is no realpolitik of prospects. Peace comes at a cost. 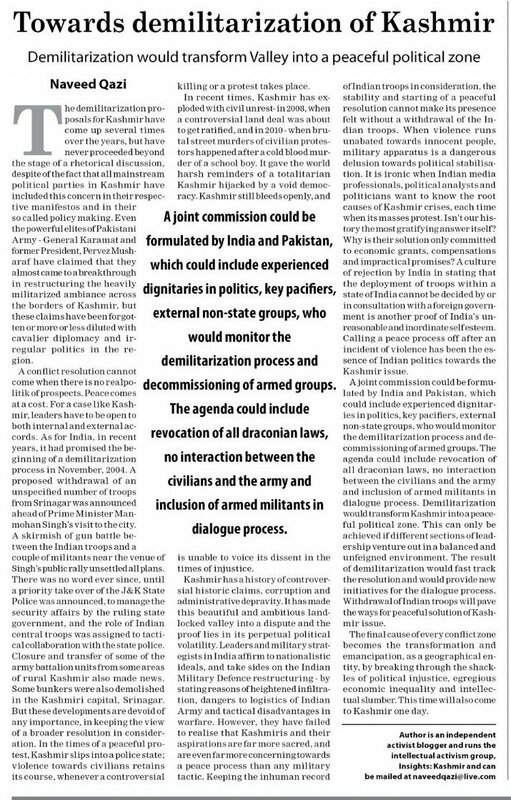 For a case like Kashmir, leaders have to be open to both internal and external accords. As for India, in recent years, it had promised the beginning of a demilitarization process in November, 2004. A proposed withdrawal of an unspecified number of troops from Srinagar was announced ahead of Prime Minister Manmohan Singh's visit to the city. A skirmish of gun battle between the Indian troops and a couple of militants near the venue of Singh's public rally unsettled all plans. There was no word ever since, until a priority take over of the J&K State Police was announced, to manage the security affairs by the ruling state government, and the role of Indian central troops was assigned to tactical collaboration with the state police. Closure and transfer of some of the army battalion units from some areas of rural Kashmir also made news. Some muddy army bunkers were also demolished in the Kashmiri capital, Srinagar. But these developments are devoid of any importance, in keeping the view of a broader resolution in consideration – Kashmiri people still live in the world’s most militarized zone. In the times of a peaceful protest, Kashmir slips into a police state; violence towards civilians retains its course, whenever a controversial killing or a protest takes place. In recent times, Kashmir has exploded with civil anarchy - in 2008, when a controversial land deal was about to get ratified, and in 2010 - when brutal street murders of civilian protestors happened after a cold blood murder of a school boy. It gave the world harsh reminders of a totalitarian Kashmir hijacked by a void democracy. Kashmir still bleeds openly, and is unable to voice its dissent in the times of injustice. 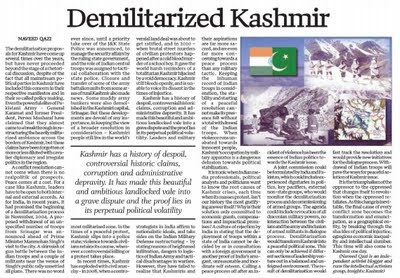 Kashmir has a history of despoil, controversial historic claims, corruption and administrative depravity. It has made this beautiful and ambitious landlocked vale into a grave dispute and the proof lies in its perpetual political volatility. Leaders and military strategists in India affirm to nationalistic ideals, and take sides on the Indian Military Defense restructuring - by stating reasons of heightened infiltration, dangers to logistics of Indian Army and tactical disadvantages in warfare. However, they have failed to realize that Kashmiris and their aspirations are far more sacred, and are even far more concerning towards a peace process than any military tactic. Keeping the inhuman record of Indian troops in consideration, the stability and starting of a peaceful resolution cannot make its presence felt without a total withdrawal of the Indian troops. When violence runs unabated towards innocent people, Kashmir’s occupation by military apparatus is a dangerous delusion towards political stabilisation. It is ironic when Indian media professionals, political analysts and politicians want to know the root causes of Kashmir crises, each time when its masses protest. Isn’t our history the most gratifying answer itself? Why is their solution only committed to economic grants, compensations and impractical promises? A culture of rejection by India in stating that the deployment of troops within a state of India cannot be decided by or in consultation with a foreign government is another proof of India’s arrogant, unreasonable and inordinate self esteem. Calling a peace process off after a victim of violence has been the essence of Indian politics towards the Kashmir issue. A joint commission could be formulated by India and Pakistan, which could include experienced dignitaries in politics, key pacifiers, external non-state groups, who would monitor the demilitarization process and decommissioning of armed groups. The agenda could include revocation of all draconian military powers, no interaction between the civilians and the army and inclusion of armed militants in dialogue process. 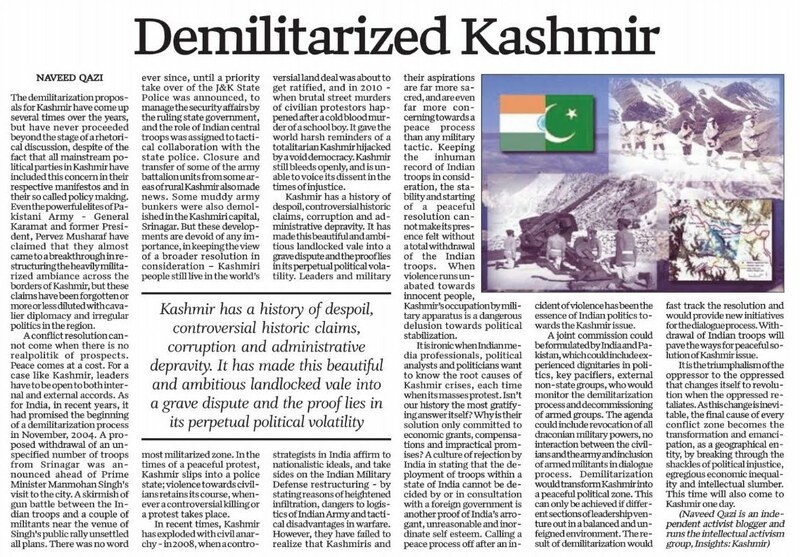 Demilitarization would transform Kashmir into a peaceful political zone. This can only be achieved if different sections of leadership venture out in a balanced and unfeigned environment. The result of demilitarization would fast track the resolution and would provide new initiatives for the dialogue process. Withdrawal of Indian troops will pave the ways for peaceful solution of Kashmir issue. Triumphalism of the oppressor to the oppressed changes itself to revolution when the oppressed retaliates. This change is inevitable. The final cause of every conflict zone is the transformation and emancipation, as a geographical entity, by breaking through the shackles of political injustice, economic inequality and intellectual slumber. This time will also come to Kashmir one day.